Now you need to prepare a landing page that you′ re going to optimize. There are two options: you either modify an existing page, or make a new one. Time to pick out one of your site′ s pages to act on. Follow my instructions, to make the right choice. On the first results page, you′ ll see a list of 10 pages that belong to your site and rank best for the keyword wedding gifts. 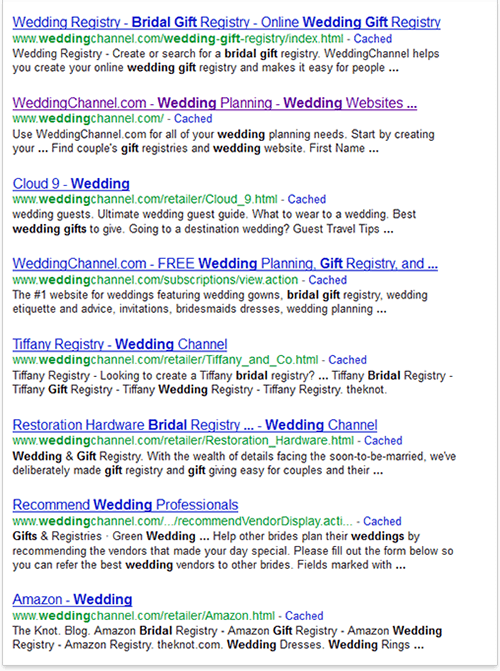 If you made a normal query, just with a keyword wedding gifts, you′ d see 10 best ranking pages among all websites. And right now, it′ s almost the same. You see top 10 pages for the keyphrase wedding gifts. The only difference is that all these pages are on your own website. And, you choose one of these 10. Why? The logic is simple: best–ranking pages are already good, in SEO terms. So if you pick a #1 page, this will save you much effort to optimize. Still, you need to choose between all ten best–ranking pages if you don′ t want to change some of your already well optimized pages. For instance, now I′ m optimizing a site that sells kitchenware. When I just started, the page that ranked best for free delivery kitchenware was the "buy" page. As I looked at it, I saw that this buy page is greatly done. It makes order and payment convenient, and it′ s not supposed to convince anyone to buy, because if visitors are there, they are already convinced. So it′ s not wise to change this kind of a page. I mean, in a case like this, you′ d better pick out another one. So, look through your 10 best–ranking pages. Think about each of them, and choose the one you′ d like to optimize now. If you didn′ t pick out any of your 10 best pages no problem! First, go to your site and choose a typical page with your usual navigational links, headers and footers. Found one? OK, now the #1 thing to do is save a copy of this page with a good search–engine–friendly name. I mean a name that has at least one keyword in it. Here are some examples. If your main keyword is tyres, a name like tyres–for–trucks–and–buses.html will be great. Or, if your page′ s name is /buy–gifts.html, and wedding ideas is your keyword, a pretty good new name for the page will be /check –wedding–ideas.html. Don′ t forget that users see these names and sometimes bookmark and even memorize them. So write something that makes sense. After you upload the file to your site via FTP, the new page appears on your site. DO IT NOW! Get ready with a page you′ ll be optimizing: choose an existing one or create a new page. I still go on with the doubt how to use these keywords in my website. I guess, I have to read more, maybe I can find sth. Dan, Very useful thank your support. Hi Mr. DAN,I would like to call you SIR. I am at very first stage of SEO,just started with few knowledge,picked a site to optimize.I see that the site is made up with many picture,slide,and animated text and set up is hard to crawl for a search engine,Now i am thinking if i make a new homepage with all of its content in just text based coding and formatted just like a simple landing page will that be good? ?as the website all about to contact and hire a web-developer. 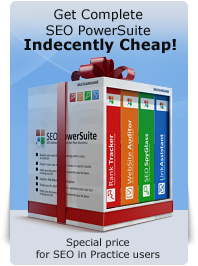 First of all, thanks for the effort put into making SEO book possible. I was just looking for something specific but have decided to start from the beggining. I already learnt a few things, I'm reading all the comments and every single word. You never know where your next big idea will come from. From working with Rank Tracker, I've seen how much time I've wasted before getting to know it. Now I'm more challenged to fine tune my whole sites. The smart thing is to learn from the experts. Thanks again. I'm new in Seo and I am enjoying this tutorial. I\\\'m creating a new landing page, now i can choose for the option to include it on the site menu or to hide it. Im wondering if it\\\'s important that the landingpage is visible on the site/ menu http://www.aovxl.nl ?? This question is also for backlinks i give to other partnersites, must these be visible? Yes, including your landing page into the site menu would be profitable, especially for attracting traffic from Search Engines. Speaking about a page with backlink partners, I wouldn’t recommend you to “hide” this page, but also shouldn’t be put up for show for every visitor. we specialize in girl's special occasion clothing and dresses. we have our main domain which is say mysite.com but we also own a domain name that is more keyword oriented like girlspecialoccasion ( only an example). My question can we this domain as an LANDING PAGE to show some products and direct the traffic to the main site. so in girlsspecialoccasion site we will 6 products which are on the main site and when someone clicks on them goes the main site. I'm finding that dashes work better than no dashes and definitely dashes over underscores. And yes, filenames still very much make a difference in SEO. Dashes or no dashes, that seems to be the question. I'm going with Dan. He's the expert! Interested in the answer to this question above. "i am very new to web design and i use wordpress, i dont use html code very much, i usually click "make new page" and name it whatever i like, is that the same thing as when you say "Here's some examples. If your main keyword is tyres, a name like tyres-for-trucks-and-buses.html will be great."?" Definitely, that's a good way to go.